Are You In A Gut Rut? If you’ve been feeling lethargic or bloated lately, it may be time to check in with your gut. Other symptoms of gut inflammation can include joint pain, skin breakouts, and irritability. While inflammation in our stomachs can occur for a myriad of reasons, it is usually our body’s way of telling us it's injured or irritated, generally as a result of unhealthy eating, stress, and/or dehydration. Below we’ve outlined some of our favorite anti-inflammation foods, supplements, and routines for respite. While this issue usually goes away with self-care and rest, if your symptoms persist, please seek medical attention. Our parents always told us to eat your greens, and they weren’t kidding. Leafy greens are not only an excellent source of essential minerals and vitamins, but they are also wonderful for aiding digestion and combatting gut issues. Spinach, which is packed with a laundry list of vitamins and omega-3 fatty acids, is an anti-inflammatory superfood that we should all be eating daily—gut issues or not. 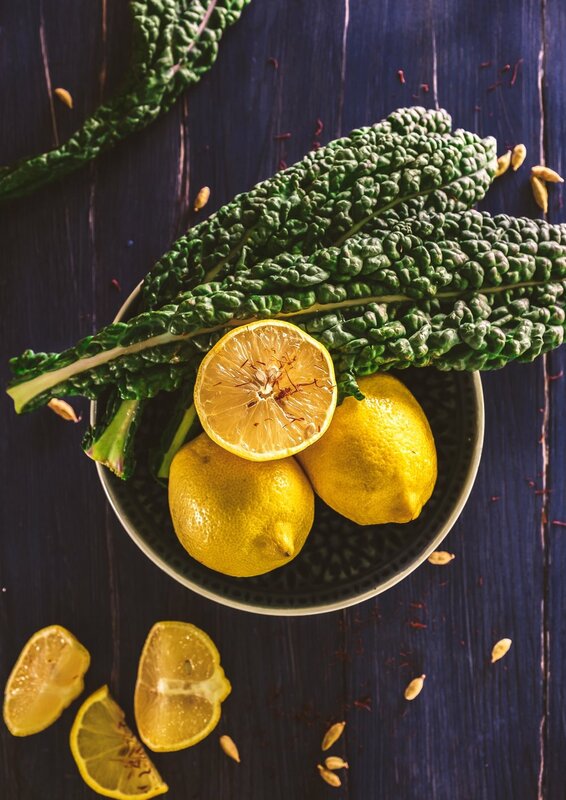 Kale, another leafy green known for its health superpowers, is also excellent for gut relief as it too contains omega-3s, as well as Vitamin K.
Add a handful of either leaf variation to your morning smoothies, fall stews, or sautéed vegetable medleys. Baked kale chips also make for a savory and healthy snack. An ancient seed first used by the Mayas and Aztecs, chia seeds are rich in minerals and nutrients—especially ones that aid digestion and relieve gut inflammation. Loved by vegans and vegetarians for the natural and plant-based omega-3 fatty acids, chia seeds are also a “functional food” meaning these tiny powerhouses fight inflammatory and nervous system disorders, combat cardiovascular diseases, and heal gut inflammation. Sprinkle (or heap) a tablespoon of this superfood into your smoothies, salads, and soups to help with gut relief. Chia seeds—which expand in liquid—are also incredible for making plant-based puddings. Try out this recipe from Feasting on Fruit for a delicious breakfast or healthy dessert. Sweet, pink, and incredible for digestion, we love consuming beets when our guts are feeling off. Containing betaine (a chemical compound that mimics stomach acid and restores your gut), as well as fiber and vitamin B-9, beets are excellent for your health. Juice them, add them to salads, or boil them up for a delicious and colorful snack. Be mindful though: consuming beets may lead to beeturia—this is normal, especially when first introducing beets into your diet! An anti-inflammatory food that can be traced back to the 4th century BC, Sauerkraut is the fermentation of finely chopped cabbage. Kimchi, a spicier variation, is a traditional and fermented Korean dish that typically includes chili powder and other seasonings. Eating either of these fermented dishes has been shown to relieve gut inflammation as it creates bacteria beneficial to your gut, also known as probiotics. Sauerkraut is also high in vitamins while remaining low in calories. Research suggests that “specific phytochemicals of sauerkraut have antioxidant, anti-inflammatory, and a chemopreventive action against certain types of cancer." To experience the anti-inflammatory effects of sauerkraut, skip the processed hot dog and add it instead to a leafy salad. You can also enjoy sauerkraut or kimchi as a side dish or a snack. While sauerkraut can be purchased at the store, try this recipe from our friend Minimalist Baker. Using seven simple and affordable ingredients (including other anti-inflammatory foods like beets, ginger, and turmeric), her recipe is sure to have your gut feeling good as new. If you are experiencing gut inflammation, skip the coffee and opt instead for a mug of green tea. Research now suggests that green tea is a powerful fighter of inflammation and we should all be drinking 3-4 cups a day. This warm and comforting beverage—sometimes called the ‘healthiest beverage on the planet’—is also known to help with cardiovascular prevention, protect your brain as it ages, and fight off certain kinds of cancer. For an organic and fair trade green tea grown in the USA, check out Arbor Teas. 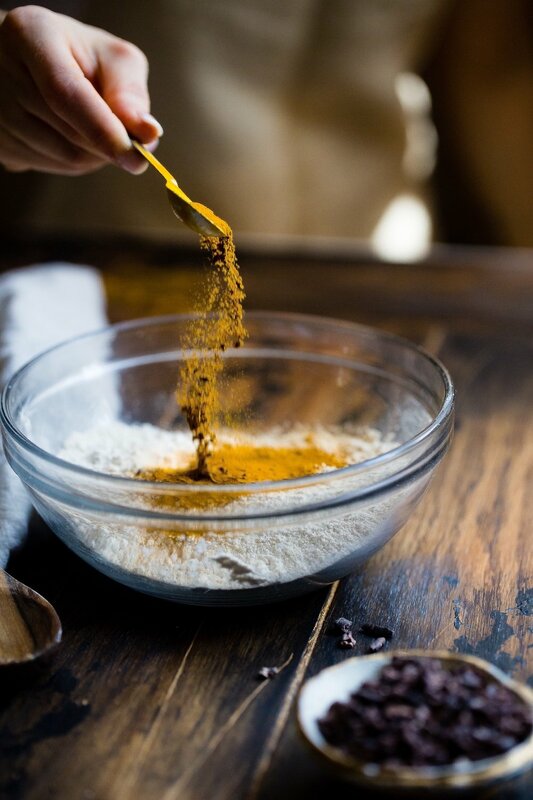 An Indian spice popular in curries, Turmeric can be traced back to Ayurvedic medicine (one of the oldest systems of medicine in the world) where it was specifically used as a remedy for inflammatory conditions. Recent studies also show curcumin, an antioxidant plant pigment found in turmeric that gives it is yellow color has anti-inflammatory properties. Curcumin may also help prevent cancer and cognitive declines onset by aging. Turmeric is an easy spice to incorporate into foods—whether you buy it raw (it looks similar to ginger root) or as a powdered spice. Enjoy on roasted veggies, in soups and curries, or blended into a smoothie. You can also add turmeric to a cup of green tea for an extra strong gut remedy. We love using essential oils as natural remedies, and clove oil is one of our favorites. A plant-derived medicine that has been used for generations to treat inflammation and soothe body aches, it is perfect for aiding your gut. Add a few drops to a carrier oil and massage onto your abdomen for instant relief. Alternatively, you can place a few drops in your evening bath to help with gut inflammation and discomfort. Two of our favorite all-natural, organic, and sustainable clove oils are Neal's Yard (£8) and Plant Therapy ($10). Once your gut is healed, make sure to keep clove oil on hand. This useful oil also works as a natural insect repellent, headache reliever, and breath freshener. Thanks to its extensive list of vitamins and minerals, Aloe Vera also works to heal and support our guts and relieve inflammation. And because it’s a prebiotic—a necessary form of fiber for probiotics (or fermented foods) to work efficiently—the spiky plant decorating our house is basically anti-inflammation magic. You can drink aloe vera juice (found in most health stores), eat it raw, or add the gel from inside the leaves to your smoothies. You know that saying ‘gut-wrenching?’ According to Harvard researchers, there is a direct connection between our gut and brain. “A troubled intestine can send signals to the brain, just as a troubled brain can send signals to the gut.” This means that taking care of your mental health and managing stress is essential to preventing gut inflammation and vice versa. It’s no secret that we’re incredibly passionate about personal wellness and mental health. So much so that we prioritize getting time away to rest, reset, and practice self-care. Avoid gut inflammation and digestive issues by taking care of your mind, as well as your body. It seems simple, but drinking water is one of the key ways to keep your gut healthy. Water is necessary for digestion, nutrient absorption, and fluid balance. Avoid gut inflammation by making water your go-to beverage, and carry a sustainable water bottle with you throughout the day as a reminder to stay hydrated. Processed foods and refined sugars are one of the most common reasons we experience gut inflammation and digestive problems. While we are advocates of living a balanced lifestyle, eating natural and organic is incredibly important. Whole foods are not only better for our minds and bodies, but they are also more sustainable for the environment and support local farmers. Choose to eat natural and organic foods when you can. On the rare occasion you do indulge your sweet tooth or consume fast food, supplement the treat with organic fruits and veggies, as well as a lot of water. For tips on eating organic, check out Myths & Truths About Shopping Organic.